305 National pre-sale tickets are available for those individuals who purchased reserved tickets in 2018. These will only be available Feb 1-28. Individuals can only purchase the same number of tickets and exact same seats they purchased in 2018 during the pre-sale. On March 1st, all remaining tickets will be on sale to the public through our website. Once again, an individual can only purchase the exact same seats as last year during this pre-sale window. In the email please state the name the tickets were purchased under last year, and section, row, and seat number if you remember the seat information. 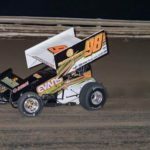 Drivers – Thursday, August 1st 2019 has been added as a practice night in preparation for the prelim night 1 on August 2nd. This will give you a chance to feel the track and tune your cars. Fans – We are still working out the details as to whether or not this will be an event that you can come out and watch. Stay tuned for more information. The High Banks Hall of Fame National Midget Auto Racing Museum in conjunction with the Kansas Antique Racers and the Colorado Vintage Oval Racers invite you to participate in the 2019 Belleville Vintage Nationals on Friday, July 26th & Saturday, July 27th. This two-day exhibition event will be hosted on the famous Belleville High Banks 1/2 mile dirt track in Belleville, Kansas. 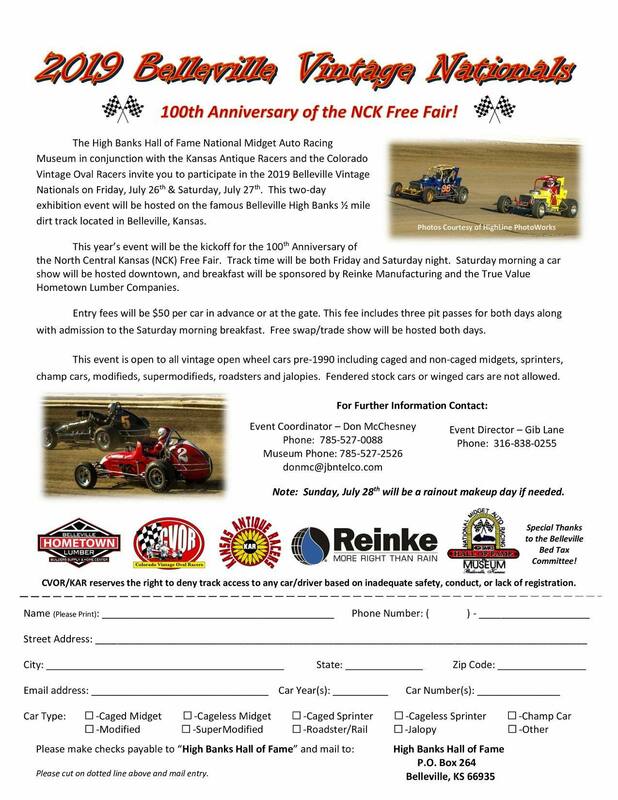 This year’s event will be the kickoff for the 100th Anniversary of the North Central Kansas (NCK) Free Fair. Track time will be both Friday and Saturday night. Saturday morning a car show ill be hosted downtown, and breakfast will be sponsored by Reinke Manufacturing and the True Value Hometown Lumber Companies. Entry fees will be $50 per car in advance or at the gate. This fee includes three pit passes for both days along with admission to Saturday morning breakfast. Free swap/trade show will be hosted both days. This event is open to all vintage open wheel cars pre-1990 including caged and non-caged midgets, sprinters, champ cars, modifieds, supermodifieds, roadsters, and jalopies. Fendered stock cars or winged cars are not allowed. Note: Sunday, July 28th will be a rainout makeup day if needed. 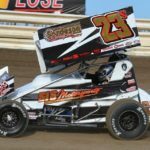 2019 305 National tickets plan to go on sale soon! The Belleville High Banks has recently undergone a major (and long overdue) website re-design. We hope to have tickets on sale soon. We are waiting to finalize our season ticket holders so we can reserve their seats before making the ticket sales public. We hope to have these ready soon! If you have any questions about tickets or our new website, please email [email protected]. 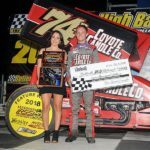 The 2018 Inaugural Sprint 305 Nationals held at the Belleville High Banks was definitely one for the records. The stands were packed, and we had 2 nights of successful and thrilling races. The future looks brighter than ever for the High Banks, as we continue to improve the track and our fan’s experience. The only question now, is who will be racing next year?! 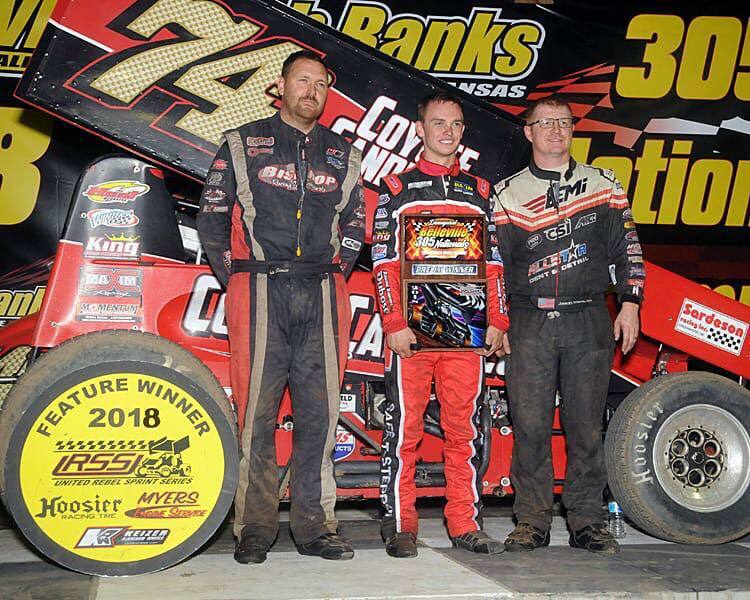 The talk is hot for the upcoming years of our 305 Nationals, and the fan excitement hasn’t been like this is years. Stay tuned, and we hope that you will join us for an upcoming race. These are photos from some of the great past memories of the High Banks.